A 67-year-old woman has died after being hit by a school bus downtown late Monday morning. 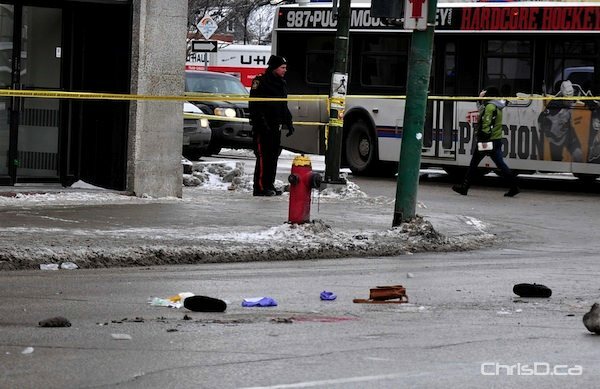 The accident happened in the area of Portage Avenue and Sherbrook Street at about 11:20 a.m.
Police say the bus was travelling northbound on Sherbrook when it turned eastbound onto Portage and collided with the pedestrian walking across the street. The woman was taken to hospital in critical condition, but later succumbed to her injuries. Investigators remained on scene for several hours and have taped off a large portion of Portage around the Tony’s Team Transport bus. Eastbound traffic on Portage between Sherbook and Furby Street was closed to all traffic while police investigated. UPDATE: Tuesday, December 21 — The deceased has been identified as Gittel Goertzen.